Choosing a baby blanket should be straightforward. The number of choices available today, however, means that knowing what to get can be difficult, especially for first time mums. In order to help you, we`ve set out some of the options available below. Cellular blankets (the ones with lots of little holes in them) are a popular choice for cots and cribs. This is because their cellular structure means that they keep baby warm in winter and cool in summer. They are usually available in cotton or acrylic. Cotton ones can be washed at a higher temperature and are softer than acrylic ones. Acrylic ones, however, dry more quickly. There is also a wide range of fleece cot blankets on the market. These are very lightweight and soft to the touch. As well as being super quick to dry, they come in lots of different colours and designs so are popular with those looking to move away from traditional nursery colour schemes. Some parents swear by swaddling blankets for their newborns. These soft blankets wrap snugly round baby and keep their arms securely in place. They can be a great way of helping baby to adjust to life outside of the womb and may help to relive colic. Modern swaddling blankets are easy to use and come in a range of colours. It is important to regularly check that baby is not too hot when using them and they should only be used for the first three or four months, until baby starts to roll over. Many babies quickly learn to kick off their sheets and blankets. They cannot do this if you use a baby sleeping bag. Sleeping bags also have the advantage of allowing you to move a sleeping baby without having to worry about disturbing them by putting them in a cold crib. Some sleeping bags are suitable from birth. It is important to make sure, however, that the sleeping bag is not too big round the neck as baby should not be able to slip down inside. Whilst quilts and duvets should never be used for a child less than one, a coverlet can be. A coverlet is a lightweight baby-friendly version of a quilt and works like a combined sheet and blanket. Some aren`t suitable for small babies so make sure to check the manufacturer`s weight guidelines before using. Some babies become attached to a particular blanket and like to have it with them for comfort and to help them feel secure. 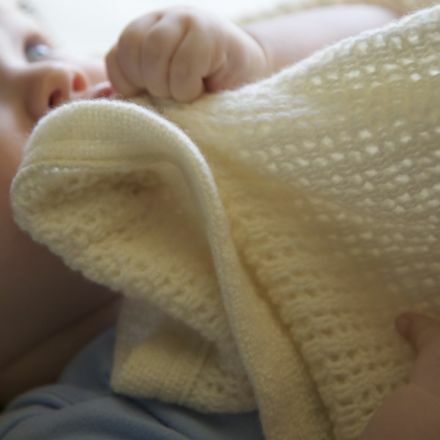 If your baby develops an attachment to his blanket you may want to consider buying a second identical one. This makes it easier for washing and also means that you have a spare if it gets lost when he`s a little older and inconsolable without it at bedtime! Becoming a new parent involves so many new choices. When choosing bedding and blankets, what you opt for is largely a matter of personal preference and will depend on factors such as whether you prefer cotton or fleece, whether you want to buy sheets and blankets that will last or sleeping bags that come in different sizes and whether you need a quick drying option. Whichever you opt for, it is always a good idea to make sure that you have enough spares as you will not anticipate how much washing baby will create until he arrives!